A triple shooting Thursday left Jaime Poole dead, and two others fighting for their lives. Photo by Abraham Rodriguez. The two men arrested on Sunday in connection with a fatal shooting in the Mission District were promptly released early this week, pending a law enforcement investigation. Robert Salvador, 22, was released Monday, and 28-year-old Sandie Harden was released Tuesday, said Nancy Crowley, a spokeswoman for the San Francisco Sheriff’s Department. Both men had been arrested in connection with the murder of Jaime Poole, 21. 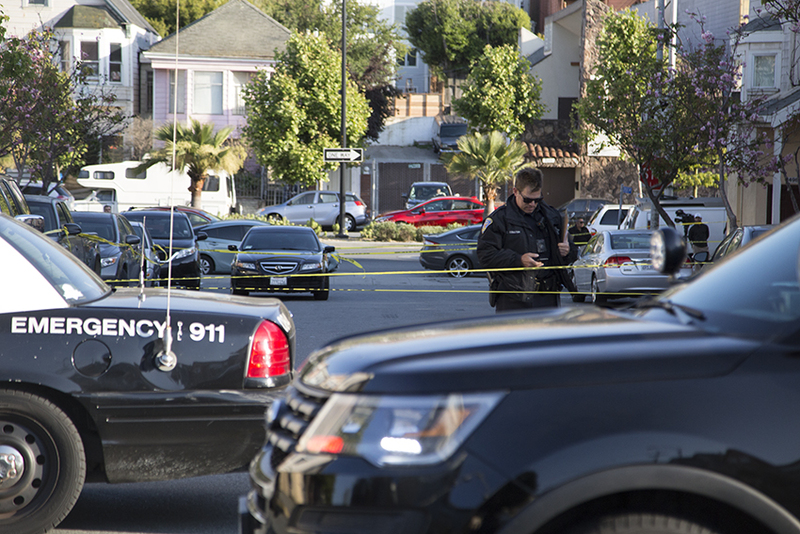 The June 7 shooting erupted at 3:20 p.m. near Bernal Dwellings, a housing development at Treat Avenue and Cesar Chavez Street, and left Poole dead from gunshot wounds. Salvador and Harden were also injured in the shootout, although both were discharged from San Francisco General Hospital earlier this week, said hospital spokesperson Brent Andrew. A source familiar with the case indicated that investigators are currently determining whether Poole shot the suspects before he was fatally shot. This would introduce a potential element of self-defense into the case. Per California self-defense laws, a person who reasonably fears bodily harm to themself or others can use deadly force. This is also true if the person believed that force was necessary to defend against the danger, and the person used no more force than was reasonably necessary to defend against the danger. Bernal Dwellings, a housing project developed in 2001, has seen its share of shootings, much to the dismay of most of its residents. A shooting there in January 2017 claimed the life of 21-year-old Ernesto Rosales, while bystanders have been injured by other shootings and others have been targeted. San Francisco Police Department Gang Task Force inspector Scott Lau once described it as a nexus of gang activity. Last February, then-Mission Capt. Daniel Perea promised to step up enforcement within the four-block area following a string of shootings. It’s unclear, however, if that ramped up enforcement has continued. Mission Captain Gaetano Caltagirone, who stepped in last October, has not yet returned messages. Recent calls for service to police can be found on CrimeMapping. The important thing is that, if we don’t have sufficient evidence to charge the suspects, police need to release their names anyway in the hopes that they will suffer some reputational damage. At the very least this will cost them a job or two. This block needs cameras for the residents’ sake. I drive by here all the time. This is the block where double parking and kicking it is a way of life. And to top it off, the double parking is in spite of the fact that there are parking spaces available all up and down the block more times than not. They do have cameras. The entire development has cameras. The problem is that they are used after the fact.. they’re not used as a preventative tool. I would like to know who the other people shot were & their current condition. In general, I would love it if Mission Local would have some kind of follow up page. For example, there has been no news on the suspects in the murder of former Mission High School student, Durby Ortiz-Guardado last February. No news also about Abel Esquivel’s murderers and what the city is doing about the fact that the gun used was from a police offier’s off-duty car (it was not locked up as it’s supposed to be). A small local paper could keep track of these things. These people’s young lives matter! They deserve justice and community members deserve to know what progress if any is being made.